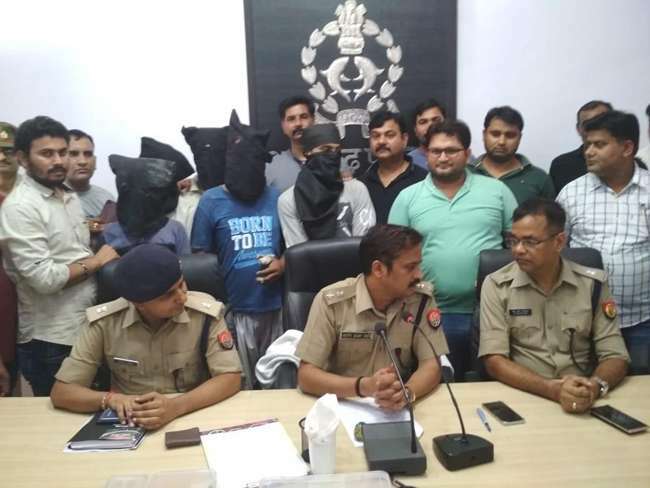 Ex-councillor Sabir Ali from Etah district, his son Nadeem and their gang of 6 others – Salman, Ifran, Yaseen, Mustkeem, Naushad, Afsar – are behind six murders, including that of two sadhus (Hindu ascetics/monks) in Aligarh & nearby areas, in the last one month, UP police has revealed. Sabir Ali is an accused in the murder of a Muslim cleric in Aligarh in 2016. According to police, he decided to target sadhus as part of a conspiracy to frame the witnesses in the 2016 murder case. During questioning, he revealed that since the UP chief minister was a Yogi (monk), he decided to target ascetics as he knew that police would act promptly in such cases. That is why after every murder, Ali and his associates left clues behind. Sabir Ali is also known by his other name Dinesh Pratap and had converted from Hindu Dharma to Islam 35 years ago. 5 members of the gang have been arrested while three – Mustkeem, Naushad and Afsar — were on the run. In news that just came in, Mustkeem and Naushad were shot dead in an encounter with UP police that also left one policeman injured. Aligarh SSP Ajay Kumar Sahini told Times of India Ali owns a large portion of Land in Etah. In 2016 after he did not get the desired price for the land, he donated 2 bighas to build a madrassa and called a cleric from Bihar, Shehzad, to run the institution. Later, the land prices spiked and several buyers lined up at his doorstep. “Ali told the cleric to leave the madrasa and go back to Bihar. However, the latter refused. After his attempt to implicate the cleric in a false case failed, Ali hired a contract killer named Shahbaz and paid him Rs 5 lakh to climate Shehzad. On April 2, 2016, Shahbaz killed the cleric,” said the SSP. On the complaint of the deceased’s wife, police arrested and jailed Ali and his associates. During his stay in the prison, the former councillor came in contact with one Afsar, and together they hatched a conspiracy to implicate the four witnesses — Haji Kesar, Jaan Mohamad, Firoz and Shoaib. After being released on bail in December 2017, Ali and his associates started executing their plan. The first murder was committed on August 12 this year under Pali police station. Two sadhus and a farmer were brutally beaten up with sticks, resulting in the death of an ascetic and the farmer. At the scene of crime, the killers dropped a chit with the names and contact details of the 2016 witnesses. The second case was reported on the night of August 26 in Atrauli. The accused attacked a sadhu, but failed to kill him. Later, they hacked a farmer to death. On the intervening night of Saturday and Sunday, Ali and his associates again tried to target an ascetic at Durainin ashram in Harduaganj, but failed. They hid in a farm in the area. However, after the farm owner and his wife questioned them, they killed the couple. They also murdered a sadhu before leaving. Police said that when they contacted the witnesses in the 2016 murder, the entire conspiracy unraveled. After every murder, the accused used the victim’s phone to call these witnesses. The SSP said that a police team comprising eight officers was rewarded Rs 1.25 lakhs for cracking the case. He said that Aligarh police has also announced reward of Rs 25,000 each on the absconding criminals. The series of brutal attacks on sadhus (Hindu ascetics) had rocked UP recently, with the lynching of 2 sadhus in a Shiv temple in Aligarh and gruesome torture and murder of 2 more sadhus in Bhayanak Nath temple in Auraiya district by a gang of cattle smugglers and butchers hogging the headlines in Hindi-language regional newspapers. It is to Yogi Adityanath & UP Police’s credit that such brutal murders were cracked in record time, a welcome change from the apathetic and desperate law & order scenario under the previous Samajwadi Party regime. But the very fact that sadhus are still being targeted with such impunity in UP shows how emboldened Islamist criminals still are, especially in West UP, and exposes the hollow left-liberal claim that Yogi Adityanath is a ‘dictatorial Hindu fascist’.